“After moving from another instructor I found Steve to be very patient, friendly and professional. 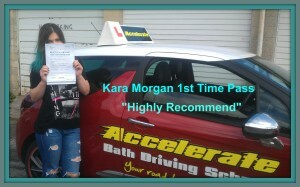 He gave me the confidence and skills to pass my driving test 1st time, I would highly recommend Accelerate Bath Driving School”. Congratulations to Kara Morgan who passed her practical driving test 1st time on the 8/09/15 at Brislington test centre in Bristol. 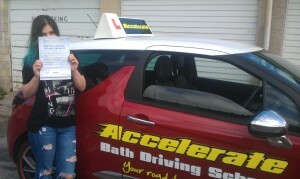 Kara drove really well and passed with just 2 minor faults. Have fun finding your first car, all the best from your driving instructor Stephen Paraskeva at Accelerate Bath driving school.